You might just get overwhelmed by all the cuteness. 1. A true AF T-shirt, because they're SO lucky to have you as their aunt instead of some of those basics who roam the streets. Get it from Love Family and Home on Etsy for $18.99+ (available in sizes NB-Adult 3XL). 2. An absolutely precious microfiber hooded puppy blanket to help them cuddle up and stay warm. Get it from Hello Snuggles for $18.99 (also available in an elephant, owl, and moose). 3. An almost too-cute UPF 50+ swimsuit perfect for when your little seedling is taking a dip in the water-melon and playing on the sandía beaches. Get it from Target for $11.99 (available in sizes 3M-9M). 4. A plush Hedwig backpack designed with a super-cool pump on the straps that makes the wings flap. Get it from BoxLunch for $39.90. 5. A classy AF tan linen suit, because what toddler doesn't need some summer linens? Get the blazer, shorts, and belt from H&M for $49.99 (available in sizes 4M-2Y). 6. A set of colorful and comfy Coco PJs so they can explore the land of the dead in their dreams. Get them from Shop Disney for $12 (available in sizes 7-13 and in a Seize Your Moment design). 7. A very pride-ful tee so your little one can wear the rainbow and their love for comfy, practical tops. Get it from Monster and the Moose on Etsy for $23 (available in sizes 3M-12T and in white, black, or blue). 8. A pair of high-top Converse sneakers to have them killin' that street-style game. Get them from Nordstrom for $30+ (available in sizes 2M-10M and in six colors). 9. A very sophisticated blazer with matching trousers, because they're gonna be in the boardroom one day — might as well get them dressed for it now. Get the trousers for $24.99 (available in sizes 8Y-14Y+ and in dark blue and black) and the blazer for $34.99 (available in sizes 8Y-14Y+ and in dark blue, dark gray, and black). 10. An Instagram-star-worthy ruffled-shoulder dress that'll surely match their influencer lifestyle. Get it from Target for $10.18 (available in sizes 12M-5T). 11. A truth-telling cotton T-shirt, because they are all of those things and everyone should know it — just in case they didn't already. Get it from Dope Blackness on Etsy for $19.99 (available in kid's sizes XS-XL). 12. A super-soft onesie so you can combine the three things you love most in this world: them, avocados, and a really solid pun. Get it from Target for $4.99 (available in sizes NB-24M). 13. A comfy and classic T-shirt to help them showcase their Desi pride whenever they wear it. Get it from AATMAJ on Etsy for $19.50+ (available in sizes NB-6, in three styles, and in white, silver, and black). 14. A cotton-blend T-shirt that'll say a lot more about you than it will about them. Get it from Penguins & Pineapples on Etsy for $16.95+ (available in sizes 6M-12 and in six color sizes). 15. 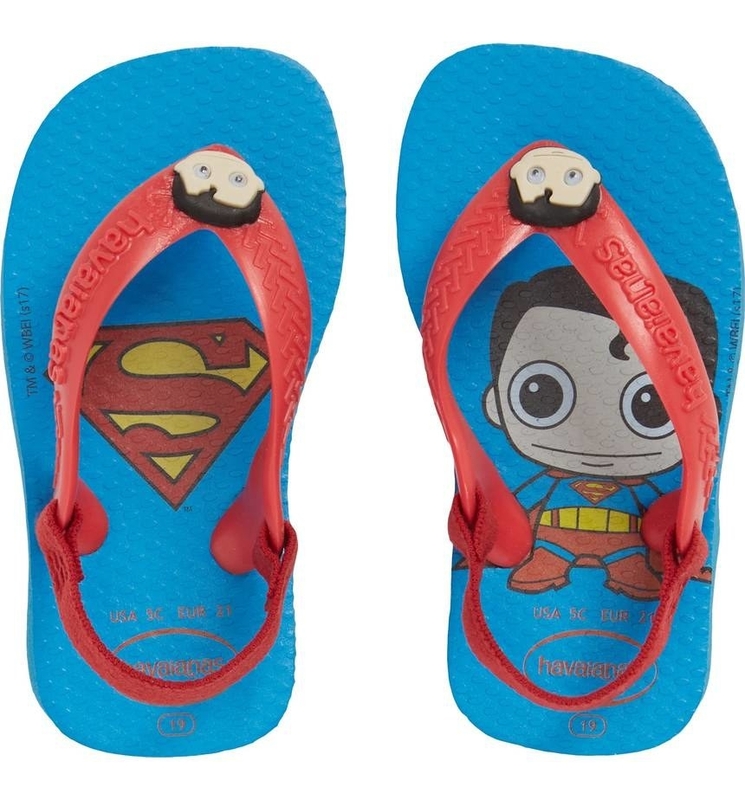 An adorable pair of superhero flip-flops to help your little beach bum fly through summer. Get them from Nordstrom for $19 (available in sizes 17 BR-22 BR and in Wonder Woman and Superman designs). 16. A super-absorbent cover-up that'll have them saying, "See you later, alligator!" — even if they can't actually form full sentences yet. Get it from Nordstrom for $35 (available in sizes 2T-7). 17. A set of superhero costumes so you can help them have the perfect look for when they need to save the day. Get the set of four costumes (including capes, masks, stickers, and temporary tattoos) from Amazon for $22.89. 18. An adorable onesie to have them showcasing how perfectly popular they're gonna be before they even have any other baby friends. Get it from Press Boss on Etsy for $14.99+ (available in sizes 0M-6T). 19. A chic AF hooded faux leather moto jacket, because let's be real, they're already cooler than you. Get it from Forever 21 for $24.90 (available in sizes 5-14). 20. A Chuckie bib set so your little nerd in the making can be just like your favorite animated nerd. Get the three piece set (including bib, socks, and glasses) from BoxLunch for $16.90. 21. 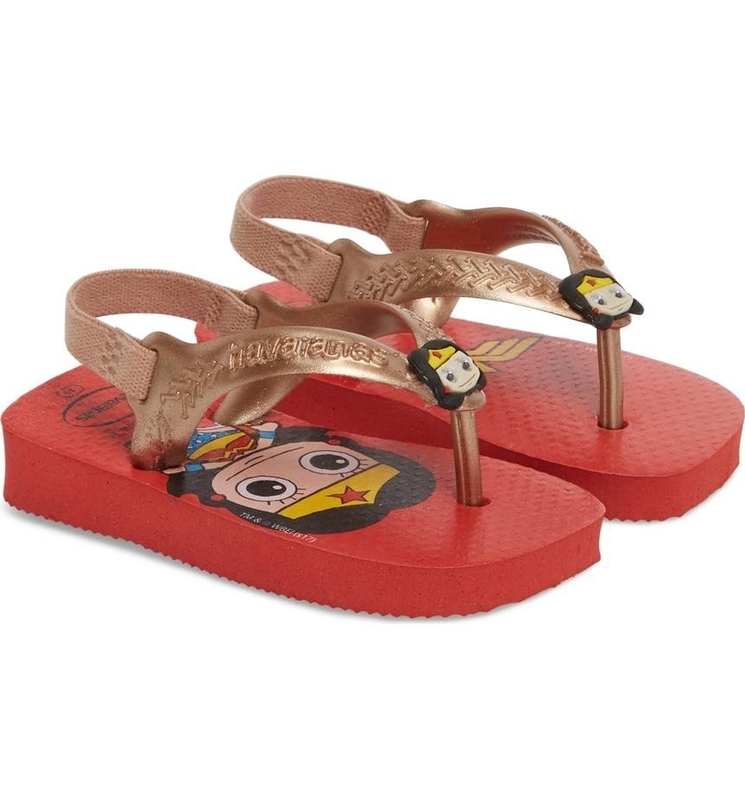 A super-cute pair of elastic crisscross sandals I really wish they made in adult sizes because there are SO. MANY. OUTFITS. they'd go with! Get them from H&M for $14.99 (available in sizes 2-5.5 and in pink and metallic). 22. An investment-worthy, classic little Burberry baby onesie so you can slowly start giving them a better wardrobe than the one you have. Get it from Nordstrom for $60 (available in sizes 3M-24M). 23. A pair of Adidas slides so you can get one step closer to turning them into your mini-me. Get them from Nordstrom for $29.95+ (available in sizes 3M-5M and in black and pink). 24. A simple little onesie that'll let everyone know who is in charge around here. Get it from Very That on Etsy for $15 (available in sizes 3M-5 and with red or black font). 25. A doggy-print shortall set with coordinating collared shirt, because there is nothing in this world cuter than a child wearing too short overalls. NOTHING. Get the set (including overalls and collared onesie) from Target for $12.99 (available in sizes NB-24). 26. An elegant tuxedo onesie, because they have that black-tie gala coming up and don't have anything to wear. Get it from Nordstrom for $40 (fits babies 0-6 months). 27. A flowing viscose jersey dress that is just sooooooo prettty! I might explode. Get it from H&M for $24.99 (available in 8Y-14Y+ and in blue and red). 28. A soft AF tank they can rock to let everyone know what's up when it comes to how they like their elote. Get it from Spanglish Thredz for $25 (available in sizes 2T-5T). 29. An adorable fuzzy little beanie to help keep their tiny little head cozy and cute. Get it from Amazon for $4.75 (available in four colors). 30. A precious O'Neill one-piece so they can live that cool, carefree summer life all year long — or until they grow out of it. Get it from Nordstrom for $44 (available in sizes 2T-6). 31. A comfy cotton-blend tee that'll let everyone know exactly what's up before they can even say it themselves. Get it from Spanglish Threadz for $23 (available in sizes 18M-Youth L). 32. A pair of Nike Cortez sneakers — did you know they made little kiddo versions of these?!?! OMG!!! They're too cute!! Get them from Nordstrom for $60 (available in sizes 3.5-7 and in pink and blue). 33. A nautical-themed set to help your little future Martha's Vineyard resident put the prep in their step. 34. An absolutely adorable tank top onesie that also doubles as a promotional piece for you. 35. A pair of very grown-up-looking swim trunks, because they're your lobster. Get them from Nordstrom for $42 (available in sizes 8-10). 36. A precious little T-shirt so they can let everyone know their sheer presence is magical. Get it from Dope Blackness on Etsy for $19.99 (available in kids sizes XS-XL). 37. A pack of fruity little hair clips so you can turn them into the modern-day version of the Chiquita Banana lady. Get the pack of six from H&M for $4.99. 38. And a pair of fancy AF Gucci loafers, because you're not their parents — you get to be totally frivolous with everything you buy them. Get them from Nordstrom for $355+ (available in sizes 24EU/8US-33EU/2US and in three colors). How could they not be the coolest kid on the block with you around?